Mirco Antenucci shows his delight at scoring his second goal for Leeds United against Derby. Remarkably in a season of underachievement so far Leeds United have now beaten three of the top five in the Sky Bet Championship and can make it four when they travel to take on Ipswich Town on Saturday. Only Brentford of the current top five have managed to avoid defeat by the Whites, who added to their earlier season wins over Middlesbrough and Bournemouth with a terrific 2-0 success against bogey side Derby County at Elland Road. More than just collecting three points, this was a great way to end a run of 12 games without a win over Derby and a morale-booster of the highest order as the performance was equally important and one of United’s most convincing of the season. 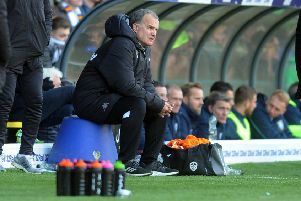 With good displays throughout the team from outstanding skipper Stephen Warnock at the back through prodigious young talents Alex Mowatt and Adryan in midfield to strikers Souleymane Doukara and Mirco Antenucci, who now have 14 goals between them, there were real signs that head coach Neil Redfearn was beginning to be proved right that there could be big things round the corner. At least it looks now like he will make it past the six games given to both his predecessors to prove that they could do the demanding job. With Leeds still down in 15th place Redfearn was not getting carried away after the win over the leaders, but he did say he believed it had been coming with his side playing well and not always getting what they had deserved. He said: “I thought we were excellent. Derby are a top side, you can see that, but we came on to them and it shocked them. They played well but we were better. “We have just put a very good Derby side away with an outstanding display. “The experienced players are leading by example and the young kids are finding their feet more and more and getting better with every game. “To me this is part of the progression. I think we have played well in games and not got what we’ve deserved. This time we did and the more we put these performances in the better we will get. Now Redfearn’s task is to ensure United play consistently at the level set against Derby and they face a different sort of challenge this Saturday against second-place Ipswich, whose more traditional English style play is the sort that has given this Leeds team problems so far this campaign. The Tractor Boys will not, however, be able to include striker Noel Hunt in their side. His loan move from Leeds last week paid immediate dividends when he scored their winning goal at Charlton on his Ipswich debut – after failing to score a senior competitive goal in 15 months with the Whites – but as part of the terms of his month’s deal he cannot play against United.